With each new orchestra album, pianist-composer Satoko Fujii deepens and refines one of the most startling and singular concepts in large ensemble free jazz today. Peace (January 27, 2017, Libra Records), the fifth album with her 15-member Orchestra Tokyo, is no exception. A tribute to the late guitarist Kelly Churko, the recording features special guests drummer Peter Orins and trumpeter Christian Pruvost with whom Fujii and her husband Natsuki Tamura perform in the collective quartet KAZE. Together these friends and colleagues create one of the most personal of Fujii's 18 (!) big band albums. "I always try to come up with a special concept for each recording project," Fujii says. "When we recorded Peace, KAZE was in Japan touring. The two French musicians are very different from the Japanese musicians in the orchestra, so I thought it might be interesting to see how they all could draw inspiration from one another. I wanted to bring their voices into my Tokyo orchestra to get some kind of creative chemical reaction. I like how it came out. I think it succeeded." 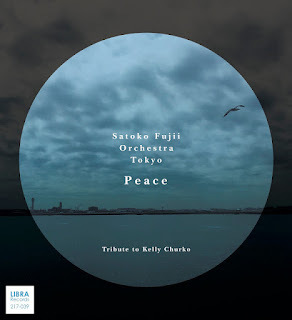 Besides introducing special guests to the orchestra, Fujii also wanted to pay tribute to one of her most beloved collaborators, Canadian guitarist Kelly Churko, who lived in Tokyo for more than a decade and was a member of the Orchestra Tokyo from 2009 and the First Meeting quartet (Churko appears on the orchestra's 2010 release, Zakopane and First Meeting's Cut the Rope CD.) "He was an amazing person and such a talented musician," Fujii says. Fujii wrote "Peace" in Churko's memory. From the title, you might not expect the full throttle intensity and explosive energy of the composition. Fujii showcases the entire sax section in a pulsating, triple forte collective improvisation to open the piece and the energy level never drops as baritone saxophonist Ryuichi Yoshida delivers a roaring solo, alto saxophonist Kunihiro Izumi swoops and wails and the drummers engage in earth-shaking duet. As Fujii explains, "Kelly loved noise music and crazy heavy metal sometimes, but he was the guy who was very peaceful and loved peace." Churko died of cancer in 2014, so the sprawling half-hour composition "2014" has a tie to the guitarist as well. Working on a large musical canvas, Fujii has plenty of space to explore different aspects of the orchestra, from extended melodies to massive orchestral chords to subtle orchestrations. Fujii deploys duo and trio combinations of improvisers to enrich the written material. First up are the special guests Pruvost and Orins, followed by trombonist Yasuyuki Takahashi and tenor saxophonist Masaya Kimura. The energy level of the performance jumps suddenly as the drummers go at it together and then trumpeters Natuski Tamura and Toshihiro Koike chatter and soar before bright and bold full ensemble blasts. A trio improvisation with trumpeter Takao Watanabe, trombonist Haguregumo Nagamatsu and tenorist Kenichi Matsumoto unfolds over a funky beat before bassist Toshiki Nagata has the final say. Tamura's "Jasper" opens serenely, with featured soprano saxophone soloist Sachi Hayasaka improvising almost a call to prayer. The music builds to an impressive full orchestra crescendo before retreating to the hushed drone that began the piece. "Jasper was a cat of our old friend's, Jane Wang in Boston," Fujii explains. "He was Natsuki's best friend. They could communicate somehow and enjoyed napping together." The album closes with "Beguine Nummer Eins," a melodic dance number whose title is a legacy of Fujii and Tamura's years spent in Berlin. (They are now based back in Japan.) Trumpeter Yoshihito Fukumoto delivers a robust, lyrical performance. Critics and fans alike hail pianist and composer Satoko Fujii as one of the most original voices in jazz today. She's "a virtuoso piano improviser, an original composer and a bandleader who gets the best collaborators to deliver," says John Fordham in The Guardian. In concert and on more than 80 albums as a leader or co-leader, she synthesizes jazz, contemporary classical, avant-rock and Japanese folk music into an innovative music instantly recognizable as hers alone. Her most recent group, Satoko Fujii Tobira with trumpeter Natsuki Tamura, bassist Todd Nicholson, and drummer Takashi Itani, released their debut recording Yamiyo Ni Karasu in 2015. "There are pulse-pounding rhythms, vibrant tones and dark chords woven together into a multi-shaded tapestry of soundŠWhat an absolute pleasure to listen to Satoko Fujii." wrote Travis Rogers Jr. in The Jazz Owl. Over the years, Fujii has led some of the most consistently creative ensembles in modern improvised music, including the ma-do quartet, the Min-Yoh Ensemble, and an electrifying avant-rock quartet featuring drummer Tatsuya Yoshida of The Ruins. She has also established herself as one of the world's leading composers for large jazz ensembles, leading Cadence magazine to call her, "the Ellington of free jazz." Her ultimate goal: "I would love to make music that no one has heard before." Although Fujii is renowned as a pianist, her keyboard playing is not heard on Peace. "For me, composing is one of the most delicious parts of being a musician," she says. "I compose the piece but the composition is more like the starting point for improvising. With my orchestra, conducting is my improvisation. I can arrange my compositions on the stage with a lot of inspiration from my bandmates' playing. I'm not playing piano as much with my orchestra now. Many times, I don't play at all. I am just too busy directing and cueing the band. My band is my instrument."